In a large pot, heat the oil over medium to high heat. Put 3 kernels into the oil and cover the pan. When those kernels pop, add the rest of the kernels and pour the sugar on top. Place lid on top, and once you hear the popping, gently shake the pot by moving it back and forth over the heat. DO NOT, I repeat, DO NOT open the lid while it’s popping, because there will be hot oil and flying objects trying to escape. 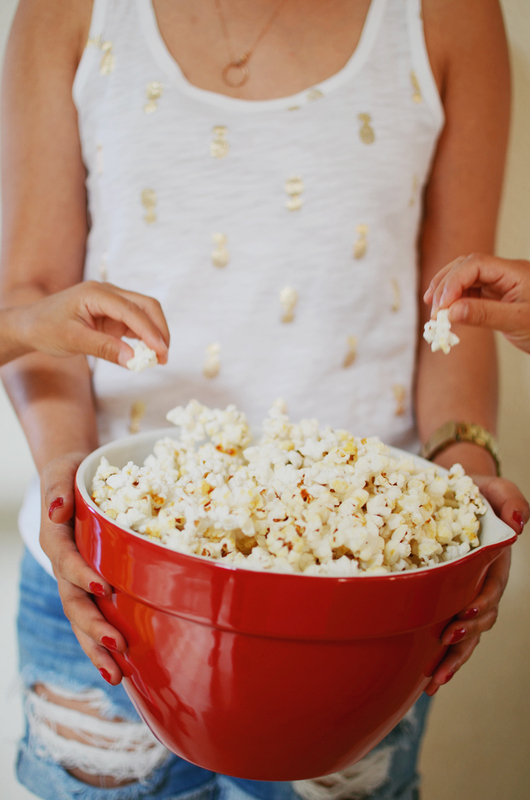 Once the popping slows (or you don’t hear any pops for a few seconds), remove the lid, and dump the popcorn into a large bowl to be enjoyed by all! If you want to make it savory, sprinkle some salt on top. My best friend came over last week for some hang out and crafting time, and she’s the one who made this kettle corn. I honestly never knew it was that easy! Sounds silly, but my mind was blown. I loved it so much, we made two batches that day; one for snack time in the afternoon, and one as an after-dinner dessert for dinner club. For the first batch, we used 1/4 cup of oil, but as I was excitedly telling Ben (when I picked him up from work) how easy it is to make kettle corn, he was taken aback by the amount of oil. So for the next batch, we just used 1/8 cup and came out just as yummy. 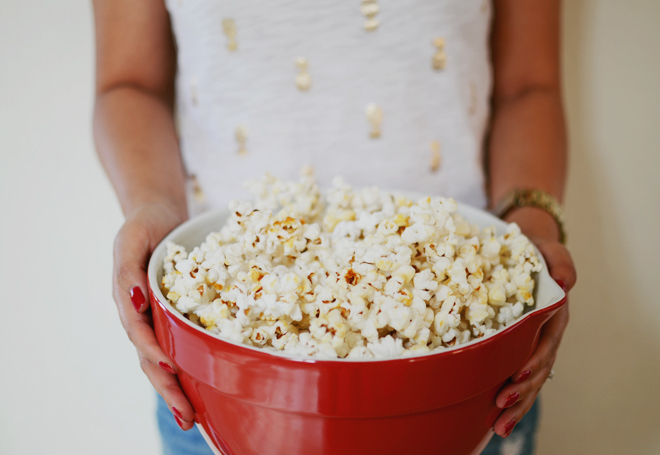 I’m not a fan of regular buttered popcorn, but kettle corn… oh yes, please! Yum I LOVE kettle corn! Can you please verify what kind of oil you used? Popcorn oil, vegetable, etc? Thank you for noting I left it out! I used canola, I sure vegetable oil will do. I have the pineapple tank too, in grey/silver. It is my favorite shirt this summer. I want to wear it all the time. Actually, the one holding the popcorn isn’t me, it’s my best friend. And I agree, her pineapple tank is cute! You should try nutritional yeast on your regular popcorn. Sooo good. thanks for the recipe! would coconut oil work as well? I’ve never tried, but I don’t see why not! In fact, today I just bought some organic kernels from Trader Joe’s at right next to it was the coconut oil, so I’m guessing it would go good with it! 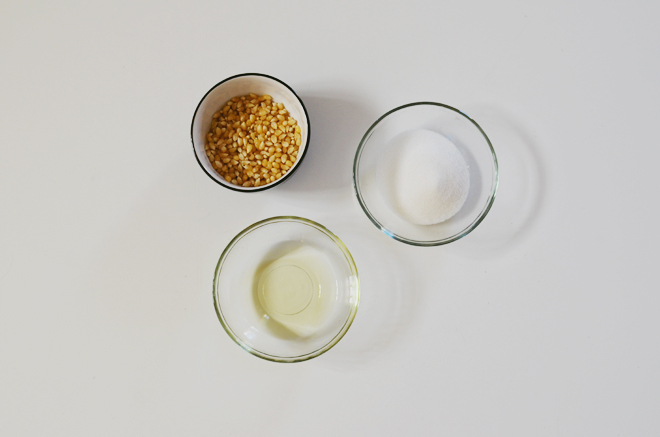 We always make our kettle corn with coconut oil… super yummy! I’ll have to pick up a bottle and try it! yum! kettle corn is my fave! I always make popcorn in the microwave with zero oil! 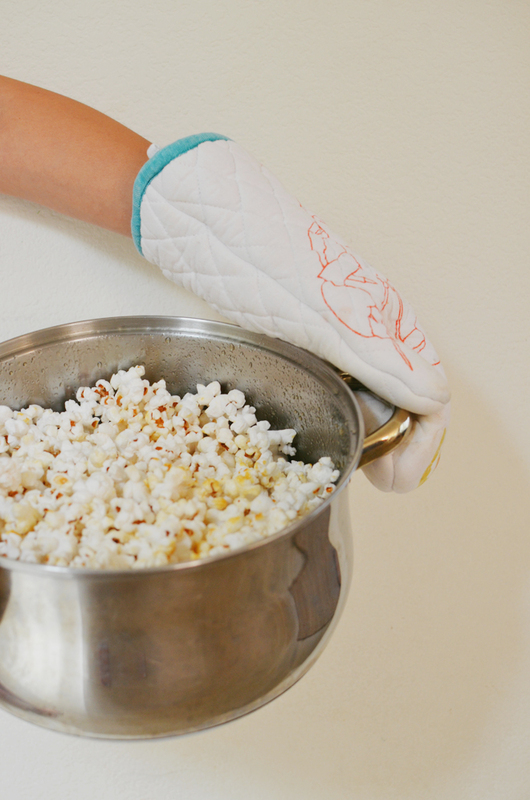 You just need a microwaveable container with a lid and again listen for when the popping slows down. I keep shaking and sort of rolling the pot back and forth over the burner. It takes a few tries to get it down. My first couple batches ended up burnt too.